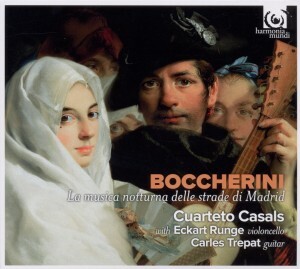 …wrote Strad magazine upon hearing Cuarteto Casals for the first time, shortly after its inception in 1997 at the Escuela Reina Sofía in Madrid. To celebrate its 20th anniversary season, Cuarteto Casals has embarked on an especially ambitious project: a six-concert series of the complete Beethoven quartets, accompanied by six commissioned works written by composers of its generation, to be premiered at Wigmore Hall (London), Konzerthaus (Vienna), L'Auditori (Barcelona), Auditorio Nacional (Madrid), Conservatorio Giuseppe Verdi (Turin) and the String Quartet Biennale Amsterdam. Additionally, the quartet will perform complete Beethoven cycles in the Philharmonie (Berlin), Gulbenkian Foundation (Lisbon), Suntory Hall (Tokyo), Konserthus (Stockholm), Flagey (Brussels) and Schubertiade (Vilabertran). The quartet's recordings of the complete Beethoven quartets will be released by harmonia mundi in three CD box-sets over the coming seasons, culminating in 2020, the 250th anniversary of the composers birth. 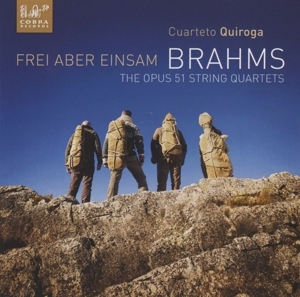 Since winning First Prizes at London and Brahms-Hamburg competitions, Cuarteto Casals has been regularly invited to perform on the world's most prestigious stages including Wigmore Hall, Carnegie Hall, the Berliner Philharmonie, Wiener Konzerthaus, Kölner Philharmonie, Cité de la Musique Paris, Concertgebouw Amsterdam and the Schubertiade in Schwarzenberg. The quartet has recorded with harmonia mundi since 2003, recording to date 11 CD’s of repertoire ranging from lesser known Spanish composers Arriaga and Toldrá to Viennese masters Mozart, Haydn, Schubert and Brahms, through 20th century greats Bartók, Ravel and Ligeti, as well as a live DVD recording of the Schubert quartets on the Neu Records label. 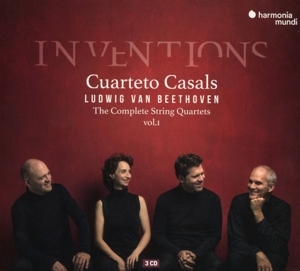 “A sonic signature entirely its own”, raved the New York Times, describing Cuarteto Casals’ distinctive range of expression. A prize from the prestigious Burletti-Buitoni Trust in London enabled the quartet to aquire a collection of matching Baroque and Classical period bows which it employs for works from Purcell through Schubert, refining its ability to distinguish between diverse musical styles. In addition, the quartet has been profoundly influenced by its work with living composers, especially György Kurtág, and has given the world premiere of quartets written by leading Spanish composers, including a new concerto for string quartet and orchestra by Francisco Coll, premiered with the Orquesta Nacional de España. In recognition of its unique contributions to the cultural life of Catalunya, Cuarteto Casals has been acknowledged as ambassadors of Catalan culture by the Generalitat of Catalunya and the Institut Ramon Llull. Past awards include the Premio Nacional de Música, the Premi Nacional de Cultura de Catalunya and the Premi Ciutat Barcelona. Cuarteto Casals often appears on television and radio throughout Europe and North America, and in addition to giving much sought-after masterclasses, they are quartet in residence at the Escola Superior de Musica de Catalunya in Barcelona, where all four members reside.